Very interesting. Google said their shipping was $21 and that made Aliexpress cheaper. I didn't actually check the site. That is very interesting... All I know is that on the one I ordered, the expedited shipping was free. It is a bit scary how many people have problems with these on facebook. If yours works they reply with "wait 2 months". 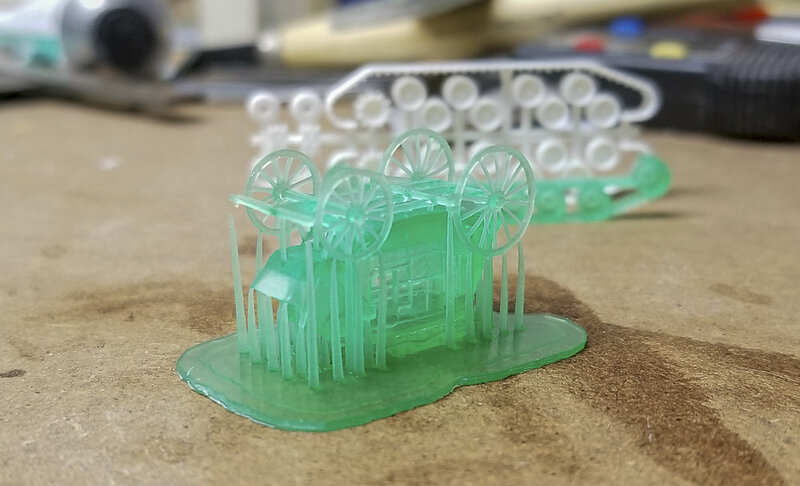 And even when they do work many get failed prints. I'm talking like 6-7 people just today. Is there a warranty that comes with these? Well we're talking about 'future technology' here so that's understandable. And that's the main point for this thread; an extended look at the Photon for Model Railroading. 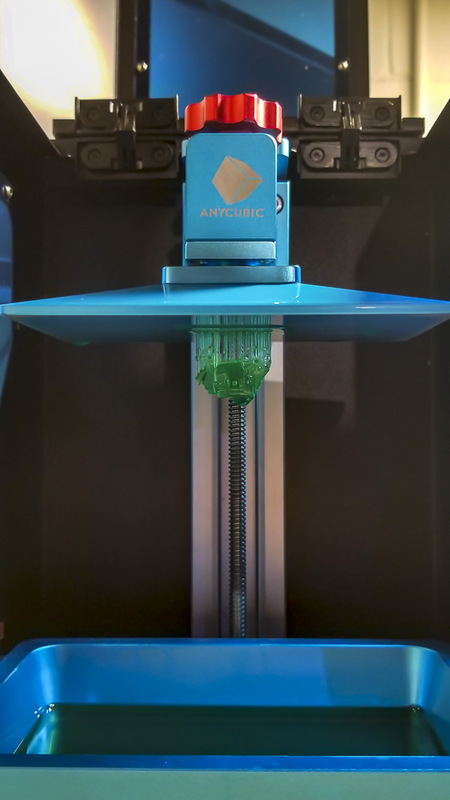 I'd wager a lot of those folks on Facebook think this should be a plug-n-play machine (Anycubic's marketing certainly makes it seem that way), but we know better than that. There are a lot of variables to keep track of. I've been playing around with the Stagecoach some more. The coach from my first test print used supports attached to the topside of the model. 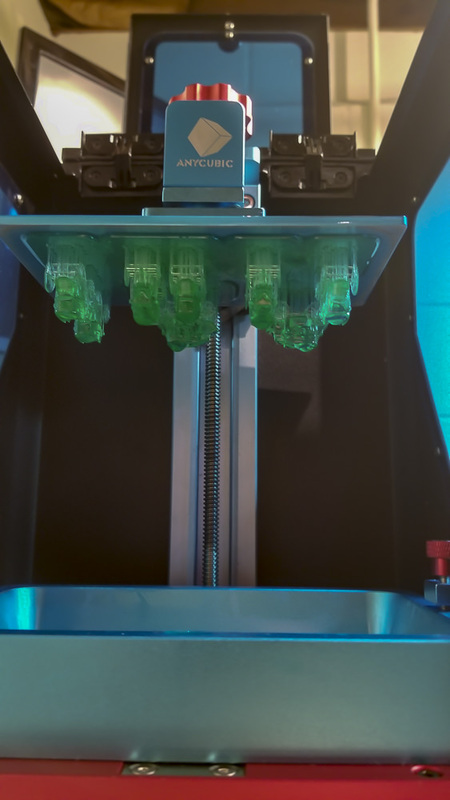 The supports attach to the model with a .3mm burr and so far do quite well in supporting the print and simply snapping off almost flush with a pluck of a pair of tweezers. Unfortunately I made the model too close to the plate, so the initial support layers made things difficult. For test two, I decided to start over and try supports from the underside of the model. This one came out even better! Being successful, I decided to load up the plate with as many stagecoaches as I could fit and started a run before bed. This morning I woke up to 8 perfect Stagecoaches! Now, one thing I imagine folks in that FB group would miss; even though this was a successful print, checkout the gradient on my support platforms. Seeing where these were positioned in the above photo, something is not level toward the rear of the plate as the platforms are much more thin in the back. Without addressing this, one might thing they're all set for another run, then wonder why they got a failure. Nonetheless, I now have 10 more stagecoaches for my 1868 unit train! And per Netfabb analysis, each of these coaches plus supports should be using 5.25ml of resin. I imagine I end up with about as much in waste, so let's figure 10ml total. Using Amazon prices for 500ml of resin (~ 8.2 cents/ml) each coach costs me 82 cents. For comparison, Shapewyas wants $23.86 for my 3 pack, before adding any markup of my own. Yes I did see a bunch of "newbie" on FB. Some have the printer without even knowing how to make a drawing file. And some are unwilling to even take the cover off their machine to check things out. Yesterday I played around more with the slicer to get more comfortable with it. Impressive. The non-level build plate is certainly not an impediment in your model since you're dependent on the supports, but I see where it could be an issue for somebody building directly from the plate. A structure model, for instance. Curious how much effort to fix and recalibrate. When you place the models on the build plate you need to balance out the projected area of the part. The suction from first few layers can throw the level out giving you the failed prints. I picked my unit up back in August from Printers Bay and have been very happy with it. I opted for the grey resin. 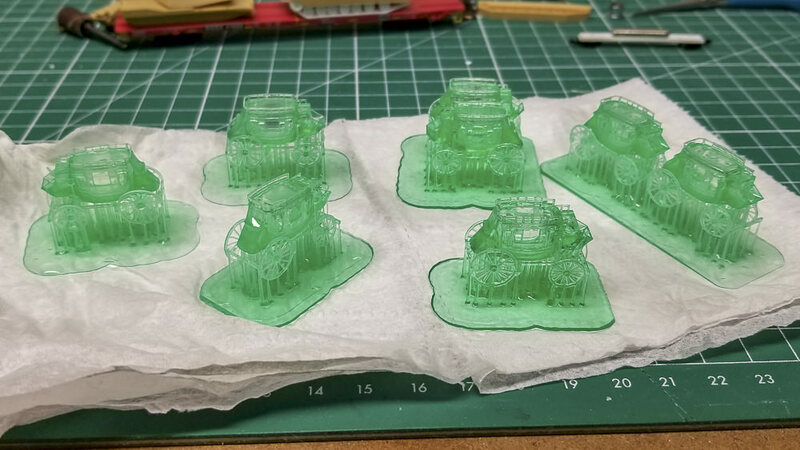 The print settings are a tad different than the green clear material. 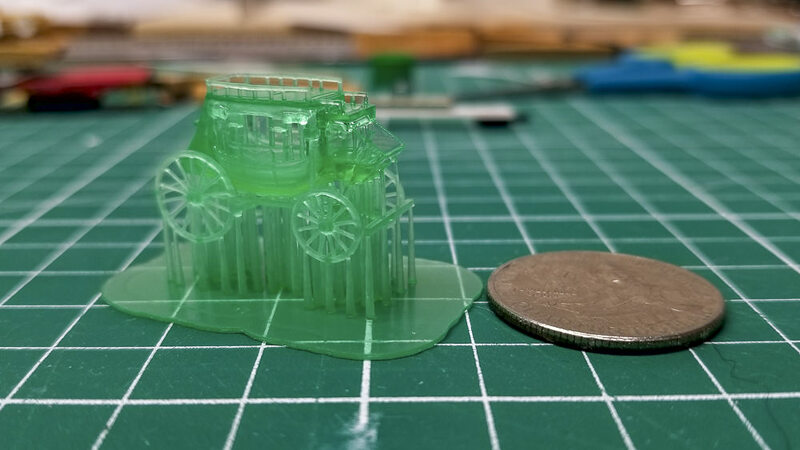 You may want to down load the calibration part to determine the best setting for your resin system ( from thingverse.) , I have to compete with my son for time on the printer. he discovered the Warhammer stl files and has been printing almost non stop space marines. We are already on our sixth liter of resin. Make sure that you use the printer in very well ventilated area. I have printed out a 4" vent adapter (found on thingverse) and hooked it up to a shop ventilation system to vent the unit directly outside the house. The resin is stinky and has some nasty volatiles. Over a period of time you may develop an allergy toward the vapors/liquid. Take the time to ventilate the work area. I also built led UV post cure chamber for the prints after they are washed, before this we were getting some cracks in the finished prints with very thick sections. The only problem I have with the printer is the need to develop better 3d modeling skills. Forgot to ask what software are you folks using for modeling, I been toying with a makerspace version of fusion 360 with limited success. Awwww screw it, I also bought a Photon from 3Dprinters bay. I looked hard at it a little while back and joined the FB group, but since I share my space with the guest bedroom, the odor concern kept me away. I'm looking forward to this thread. Gotta find the protective gear amusing, given the rest of her outfit. Disclosure: Naomi "SexyCyborg" Wu is a Chinese DIY maker and internet personality. As an advocate of women in STEM, trans-humanism, open source hardware, and body modifications, she challenges gender and tech stereotypes with a flamboyant public persona, using objectification of her appearance to inspire women. I watched that video twice. Are you sure there's a printer in it???? Yeah, about the 16:25 mark is my favorite.